Sound score by Pamela Z.
Jo Kreiter, ever the socially responsible artistic director of Flyaway Productions, has reached new heights in this production, devoted as it is to “the women who have contributed to the construction of Bay Area bridges.” As many in the audience remarked, ” I never knew women did that.” Not only is the performance full of women’s history, but, as a good dance event, it resonant with expressive gesture and beautiful movement. 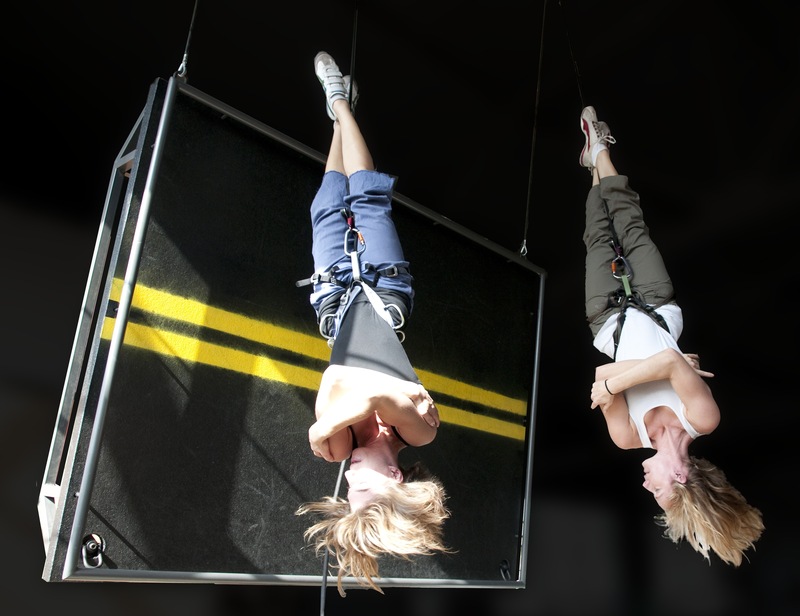 The production at the SF SOMARTS building, which is several stories high, allowed for expert extensive rigging (by Karl Gillick) and the dancers spectacular solos and duets, climbing, swinging and walking on equipment evoking those of bridge sites. There were at least seven separate sections. First, a lyric solo by Raisa Simpson, in a yellow dress, which seemed to recall the Polly Ann of the ballad, a memory of the legend. She used a small toy car to run over her body, perhaps predicting the cars that would run over bridges and through tunnels as it did over her body. The seven dancers (including Simpson in later sections) were dressed in pants and orange shirts, decorated with stripes, such as those on warning signs. An aerial duet, by Melissa Caywod and Britt Karhoff, used a large platform, suspended both vertically and horizontally, vividly not only demonstrating the hoisting of such objects as bridge parts, but also their ability to use the space fearlessly and dramatically. Kelly Kemp, with expressive ‘attitude,’ did a solo with a lunchbox on a similar platform, but on the ground, displaying her extraordinary range of movement and a dramatic disgust and dismissal of male harassment. Other aerial solos were performed by Alayna Stroud, Jennifer Chien, and Kelly Kemp. All these, plus Mary Ann Brooks, (whose solo, without rigging at ceiling level, artfully used a large wheel}, are the distinguished group of dancers that constitute the current Flyaway Productions. They are a lean and powerful group. The sound score, by Pamela Z used construction noises, electronic sound and voice over to support the intense activity. In one section, words are clearly heard, seemingly responses to the work and to the women. As “spit”, “cuss”, “take it out,” and other expletives ring in the air, the dancers respond with sassy gestures. Since the dancers were spread over a large space, it might have been more effective to have a tighter group and more unison gestured response. Other well-deserved credits go to figrueplant (set design), Mathew Antacky (lighting), Stephanie Verriès (costumes) and Harvey Schwartz (project historian). Kreiter has built a remarkable work, and she, as well as the women, who inspired the piece, deserve our applause and admiration.